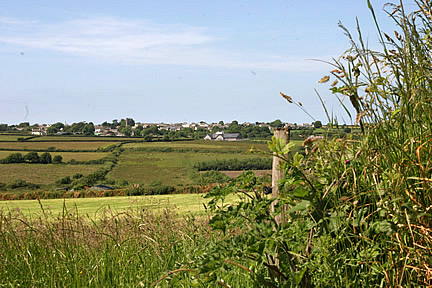 If you are touring the area take the opportunity to explore the real North Devon countryside. There are many picturesque villages off the main A39 Atlantic Highway. If you have just been to the beach at Bucks Mills go straight across the A39 at Bucks Cross and make your way to Woolfardisworthy or Woolsery. as it is known locally. 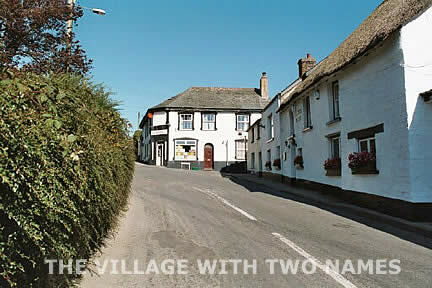 The village with two names lies inland approximately 600 feet above sea level. The country lanes are narrow and wind upwards and onwards through steep banked hedgerows. As you come down into Woolsery you can see the medieval tower of All Hallows Church on the skyline. 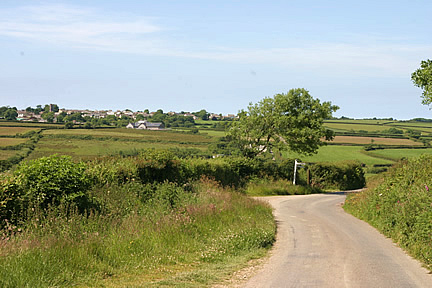 Although the actual village of Woolsery itself is quite small, Woolsery Parish covers a wide area including the hamlets of Ashmansworthy, Leworthy and Alminstone and is surrounded by unspoilt countryside with remote farms and areas of moorland, marsh, forest and woodland stretching out across the A39 to more than a mile of the Heritage Coast including the area to the west of the stream at Bucks Mills on the shores of Bideford Bay. To the south a natural border line is formed by the River Torridge. It is said the source of the Tamar can be found in the highlands about one hundred yards from the old boundary stone marked "Bradworthy-Moorwinstow" and after seeping through swamp, sedge and rushes, the waters drift in opposite directions to form the Rivers Tamar and the Torridge. The infant Torridge trickles down a shallow valley and by the time it reaches the first Bridge at Brimford has become a stream. Beyond Horton Bridge it is joined by Clifford Water and continues on through the countryside with Woolsery Parish on one bank and the northern border of Bradworthy Parish on the other. The landscape changed from earlier times when the Forestry Commission planted conifers on land that was once moorland rough grass, gorse and heather. The Commission was established in 1919 to replenish woodlands depleted in the 1st World War and by 1927 began to buy land around the village. This land, when worked in earlier times with horses was used to produce wheat not only for grain but straw for thatching and although workable with horses was too wet for modern agricultural machinery. The Sitka Spruce planted in the 1930's were harvested in the 1970's and used for commercial purposes for mine pit-props and agricultural fencing. At the time of writing the village with two names had two inns, The Manor House and the Farmers Arms. It is reputed that the Farmers Arms was originally built to house the builders of the church and in 1857 the local magistrates court was held in an upper room. Up until the 1950's the highlight of the village calendar was the Woolsery Market which was held on the 4th Thursday of each month. The indigenous North Devon Cattle, "Ruby Reds", were once sold at this market, along with sheep, lambs and pigs, as well as corn and seed, merchants and farmers settled their accounts in a private room at the Farmers Arms. In 1892 the first Woolfardisworthy "Colt Show", now the Woolsery Show, was held and apart from the war and foot and mouth it continues to be a draw for locals and visitors. It is currently held annually on the last Monday in July at Clovelly Court. Woolsery itself has a reputation for being "The Friendly Village" and this small local show works on the same principle. Don't miss the unique "Woolsery Weekend" which is held in June each year, when visitors are invited to look around the village and surrounding countryside. There is much to see and do with many of the villagers' gardens open to the public. Don't leave without sampling the delicious cream teas and lunches made with locally produced cream, butter, cheese, milk and ice cream. This is an ideal opportunity to view the award winning Village Hall where local arts and crafts are on display. Another popular event in the village calendar is a "Street Fayre" held in July when the road is closed for the afternoon. Woolfardisworthy 2005 definitely has the best of both worlds, new housing development goes side by side with the old village cottages and the community marked the Millennium with a new Village Hall. The building, which opened in December 2000, is one of the most energy efficient, low maintenance, environmentally friendly buildings in the country! Woolsery has its own Football and Tennis Clubs and the tennis courts are open to visitors. The foundation stone of the present village school was laid in 1878, the school opened with January 1879 and in his book "If only the Walls could Speak" published in 1970, Mr. C. B. Griffiths recorded - "There were eight pupils but no books! Woolsery County Primary School today has 100 pupils and although it retains its Victorian frontage it is now well equipped with many modern resources. The church of "All Hallows" is believed to have been built in the 12th century, but was mostly rebuilt in 1845, the south door is of Norman design with the Chancel retaining a restored medieval wagon roof . All Hallows was dedicated by the Bishop of Exeter, Walter Branescombe on 26th July 1261. Richard Cole, who built the old Quay at Bucks Mills is buried here, his effigy can be found at the North Door. Woolsery Chapel in Chapel street was built in 1857 but although refurbished 1993 still retains the original oak panelling around the pulpit. A formal Covenant links the Chapel and the Church - a "Covenant Candle" is used when joint services are held in both the church and the chapel. The candle has two colours intertwined to represent the two congregations worshipping together. At the heart of the village is the local Post Office Stores, a vital service for all rural communities. If you decide to stay, a "friendly" Woolsery welcome awaits you at nearby inns, hotels, restaurants or bed and breakfast establishments. In addition there is an excellent garden centre with tea rooms nearby. the Hartland Forest Golf Club is no more but the private holiday lodges on the site are still available and walkers can enjoy pleasant woodland trails or join the more demanding Coast Path at Bucks Mills. For those who prefer to explore the countryside on horseback there is a riding stables in the vicinity. Check out Woolsery Parish Council's own community web site for information on the Village Hall and community events. Woolsery was voted The best Kept Village 2008. NB. Sadly the Manor House closed its doors around 2006 and Farmers Arms pulled its final pint in December 2012, however in 2014, as widely publicised in both local and national press, both were purchased by millionaire Bebo founders Michael and Xochi Birch. The beautiful thatched inn is being restored to its former glory and in August 2016 plans were approved to turn the Manor House into a 19-bedroom hotel and public café. They also bought the village fish and chip shop, which was renovated and reopened in July 2015. Michael Birch who lives in San Francisco, originally comes from Woolsery and has a long family connection with the village. Job Andrew, Mr Birch's great-great grandfather, built Woolsery village shop, which remained in the family until it was sold in 1961. His grandmother, Millicent Andrew, was born in the village shop's premises in 1900, and his grandfather Joseph Burrow was born at Ashcroft Farm. Michael and Xochi Birch, who founded Bebo in 2005 and sold it to AOL in 2008 for £370m.